Saturday 17th September is Software Freedom Day across the world, and Hereford Linux User Group is holding one of the biggest SFD events in the UK. At the same time it’s launching its Open Source Schools Project just in time for the new term. HLUG will be at All Saints Church, High Street, Hereford, from 10am-4pm on 17th September. 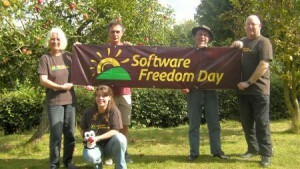 Their free event will include demonstrations of a wide range of open source software, freebies, and help, support and advice. Bring your children’s laptops and load up with free software, all ready for the new term. At 2pm Bob Higgie, lecturer at Hereford College of Technology, will be speaking on open source in education and the importance of teaching the fundamentals of computing. HLUG will be visiting schools across the county during the autumn term to introduce and encourage teachers’ and students’ use of open source software. If your school would like to be involved please contact hlug@hlug.org.uk.